If there is an easy and simple strategy, why do we have to find the hard one? The advantage of a trading strategy does not lie in how difficult the strategy is or how many technical indicators are installed. Conversely, it is often just a simple trading strategy with one or two indicators more profitable. What is a simple trading strategy like? Check out some of them here. Have you ever heard the name "Moving Average"? These are the simplest technical indicators that can be found and installed easily on all trading platforms, including Metatrader4 (MT4). How to use it for trading is very easy. You can simply install several MAs on the platform, each with a different Period and color. For example, Period 5 (MA-5) and Period 20 (MA-20). Next, observe the intersection between the two MAs to get a trading signal. For example, as in the following figure, MA-5 and MA-20 are installed in the pair USD / JPY 15 minutes timeframe (M15). Buy, if the MA-5 moves across the MA-20 towards the top. Sell, if the MA-5 moves across the MA-20 towards the bottom. Simple isn't it !? You can change the timeframe and the Moving Average period used, according to convenience. While the Target Profit and Stop Loss can be adjusted according to taste. For example, by specifying certain pips, for example 5-15 pips from the Open Position (OP) price. It may also determine the distance of several candles, for example if you use the M15 candle, then the 3-5 candle distance from the OP will close the position, both profit and loss. Alternatively, install Pivot Points, Fibonacci Retrements, or according to the Risk / Reward Ratio you use. Bollinger Bands are measuring tape of price volatility that are usually installed flanking the Simple Moving Average (SMA) line. When the Bollinger Bands band that is above and below the SMA narrows, it means that significant price movements will occur in the near future. 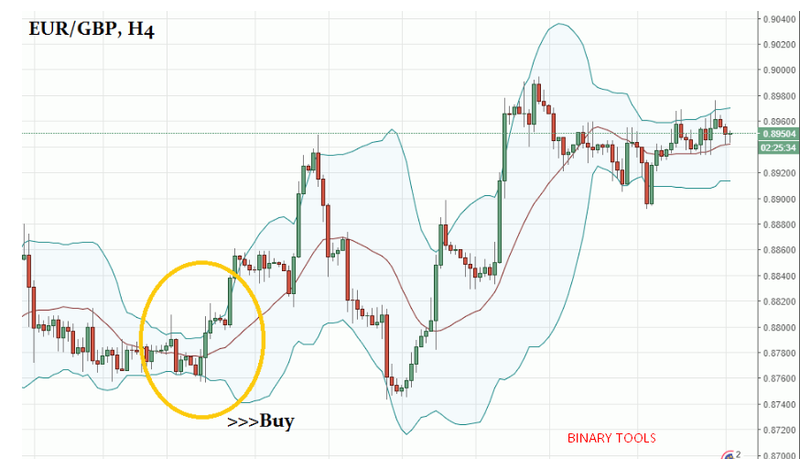 Therefore, the first step to running this trading strategy is to install Bollinger Bands. BB is usually attached to the MT4 trading platform, so the installation is as easy as looking for the Indicators menu, then select Bollinger Bands. Once installed, it will appear as in the screenshot below. Here Bollinger Bands are installed in the EUR / GBP 2 hour timeframe pair (H4) with the setting of Period 20 and Standard Deviations 2. Buy, if there is a candle closed completely above the SMA line. Sell, if there is a closed candle completely below the SMA line. Place a Stop Loss at the high or low level in the previous candle. 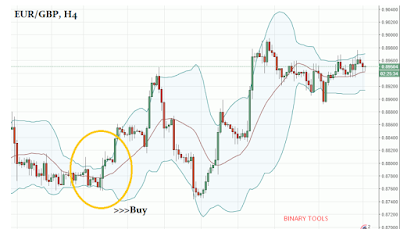 That is the simplest way to use Bollinger Bands. More complex techniques for maximizing profits can be listened to in the article on Double Bollinger Bands Trading Strategies. This second simple trading strategy does not take advantage of technical indicators that are prevalent on your trading platform. In Metatrader4, there is already Heiken Ashi, but when installing it it will automatically change the appearance and you can no longer see the usual market price movements. So, you need to look for custom indicators from other sources. Heiken Ashi's appearance is similar to Candlestick charts, but it is neater and easier to read. How to distinguish a bullish candle, a bearish candle, and a price reversal (reversal) are even simpler. As can be seen in Heiken Ashi which is placed on the AUD / USD pair 15 minutes (M15) timeframe above, the Bullish market conditions are shown in green. Bearish conditions are seen from the color of the red candle. While a significant price reversal is signaled by the appearance of a slim candle shaped like a doji. The best trading opportunity is when a price reversal, which is when the Bullish trend turns into a Bearish, or from a Bearish becomes Bullish. As a complement to Heiken Ashi, you can also install other technical indicators in the trading window. But remember, you don't need to use too many indicators. In order to still be able to read price movement charts, just 1-3 indicators are sufficient.